Over 60 MPs and leaders defect/bought from Opposition parties to Jubilee by governing leaders revealed. - Bana Kenya News, Real African Network Tubanane. Home Editorial Over 60 MPs and leaders defect/bought from Opposition parties to Jubilee by governing leaders revealed. Over 60 MPs and leaders defect/bought from Opposition parties to Jubilee by governing leaders revealed. 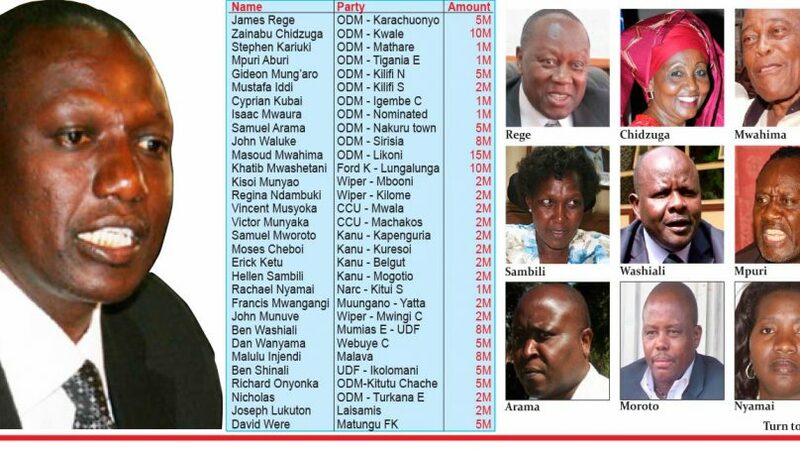 The List of MPS who were bought by Jubilee since 2016 rose from 40 Opposition members to 60. according to a report that was given out by Human rights watch indicate that the Governing party has been dishing Millions to leaders in order to get enough backup. The 40 Members who were lured to the government before January 2016 rose political temperatures in the opposition strongholds. Later, the people from the respective areas said the ones who were bought were just political rejects. 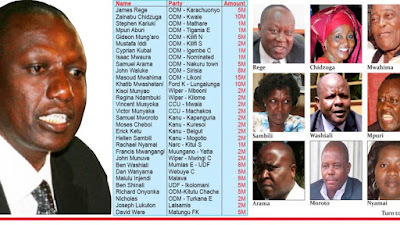 In the List of the other new 20 bought after January 2016 include, Mombasa deputy governor Hezel Katana, Budalangi Mp Abadu Namwamba,Julius Murgor, Wajir South MP Diriye,Wajir West MP Abdikadir Ore,Taita-Taveta Senator Dan Mwazo, Women Rep Joyce Lay,Tana River Governor Hussein Dado,Women Rep Halima Ware,Kilifi deputy governor Kenneth Kamto, Reginald Wanyonyi, Janet Nangabo (Trans Nzoia),Wajir MPs Adan Keynan (Eldas), Mohamed Ibrahim Elmi (Tarbaj), Ibrahim Saney (Wajir North),Ukur Yattani (Marsabit) etc. It allegedly that the DP dished more than 100 Million to Ababu Namwamba as he was the ODM secretary general. The Position of the government was to see the opposition facing political declination.